Textured, and perfectly slated or the next cold-weather season. This coat is primed to be a statement topper for all your key basics: denim and tees, skirts and blouses, leggings and button downs. I really love this! I love monkeys. Never seen a coat with monkeys and probably never will again. I love unique and unusual and this is definitely that. I love the fact that it's light weight. It's very comfortable. Beautiful rich red color. People will stop you and ask about it, for sure. Beautiful well made. The fit is perfect the material is soft and rich! The coat looks great home run Iris!! I have the giraffe coat and I love it. Im between a medium and large so I got a large so I can layer underneath it. Its unlined felt and not for cold weather and I understood this. I had to have it because of its uniqueness. Im 63 and fashion conscious. 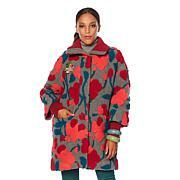 I purchased the red coat with monkey applique and it's a knockout. It's unique and stylish, calling just the right amount of attention to itself. The fabric is felt-like and has a lovely look and feel. My only quibble is that it would have benefited from a lining. Still, I expect to wear this for years. This is a nice topper, but I have better ones from this line. It is very light weight, more like a cardigan sweater. Very soft material. I would say this one runs smaller than most of Iris outer wear. The sleeves are too tight for wearing a sweater underneath. The seam on one of the sleeves pulled apart the first time I wore it. I will have to return. 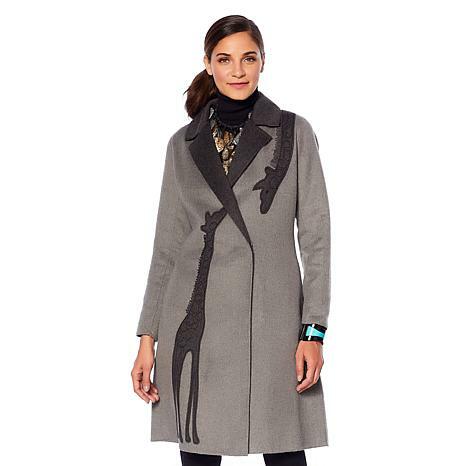 Fall in love with style suited for cold-weather. This chill-worthy coat gives you the nostalgic charm you covet when planning holiday ensembles, it stuns when you pair it with sweaters and jeans too. Colleen Lopez Lush & Luxe Embellished Faux Fur Coat Faux real? This stylish, cold-weather jacket features soft faux fur and jeweled embellishments for a look that you (and your furry friends) will love. Cozy, chic and cruelty free, it'll be your go-to piece of the season.